A$AP Rocky Admits "I Love Certain Mumble Rappers"
A$AP Rocky was one of the many talented artists to illuminate our Summer by offering fans a new album. 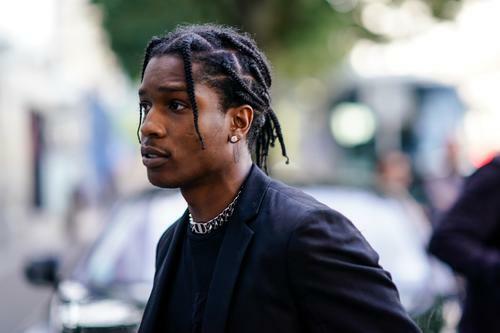 Testing received mix reviews, but overall, the project placed Rocky back into the rap conversation after he spent the last few years influencing the fashion industry. Rocky stopped by The Daily Show with Trevor Noah to promote the new album, and the two discussed a number of topics, including mumble rap. Trevor questions Rocky about his diss to mumble rappers on the project, and the late-night television host even breaks out an amazing imitation of a mumble rapper while doing so. After a hearty laugh at the spot on impersonation, Rocky explained his grudge with the mumble sound. "I love certain mumble rappers," he said. "It's, like, kinda oversaturated. Shoutouts Lil Uzi and Playboi Carti all day, man. Rockstars." He also explained his take on the current scene of New York hip-hop. "I think everything is just a big melting pot, especially America, right?" Rocky stated. "It's hard to even identify somebody's region in rap, from the way they rap. I don't really think anybody stands out, even though there's a few artists who have like this distinguished New York sound. But yeah, for the most part, everybody's music sounds dynamical and, you know, just similar to the other person's in some way. Not to diss anybody." Check out the interview, Complex, here. Daniel Caesar Apologizes After Calling Out Black People: "I Can Admit When I’m Wrong"
Lil Wayne, Snoop Dogg, & ScHoolboy Q Align For Milwaukee "Summerfest"